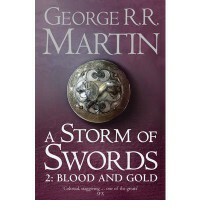 This book is part two of A Storm of Swords and I definitely recommend reading them back to back and treating them as one (admittedly huge) book. There's not really much I can say in this review for fear of spoilers, and I fear that I'm still a bit in shock over the ending to write anything coherent. Martin continues to do what he does best in this book. Character and world-building. That, and the plot moves forward in leaps and bounds and, by the end of the book, up is down and down is up. At least, it feels that way. Also, some long-standing mysteries are actually answered! As far as characters go, Jaime Lannister and Petyr Baelish make huge strides in characterisation - Jamie seems to be growing more morals with every page, and Petyr... well. Petyr is Petyr, I guess. To be honest, every single character grew in this book, and it was amazing to see. And, as far as Stannis is concerned, I am still unclear as to whether I like him or not. Also, he made me feel sorry for Cersei. That's certainly a feat and a half. And I still love Jon and Tyrion. I don't think there's anything they could do to make me not love them, but we'll see. Dany still seems a bit disconnected from everyone else, but I'm pretty sure that all the storylines Martin is weaving will come together at some point. Even though no one is safe. And even though Martin has massive balls to kill off characters we've invested so much time in. The plot seems to be moving in a more fantastical direction now (with the dragons and the Others), especially as the threat of the Others is growing with each passing book. It's almost as though the plot we've all been focused on for the last three books was actually a diversion and the true plot is only just making itself known. We'll see. And, let me just say, Sansa Stark building a snow model of Winterfell was one of the most touching and heartbreaking moments of the series so far. Part of me is dreading reading the next book, but another part of me can't wait. Such is the conflict I feel when I read these books. In that, Martin is one of my authorial idols.